Dinner A quick trip south of the border is within reach! 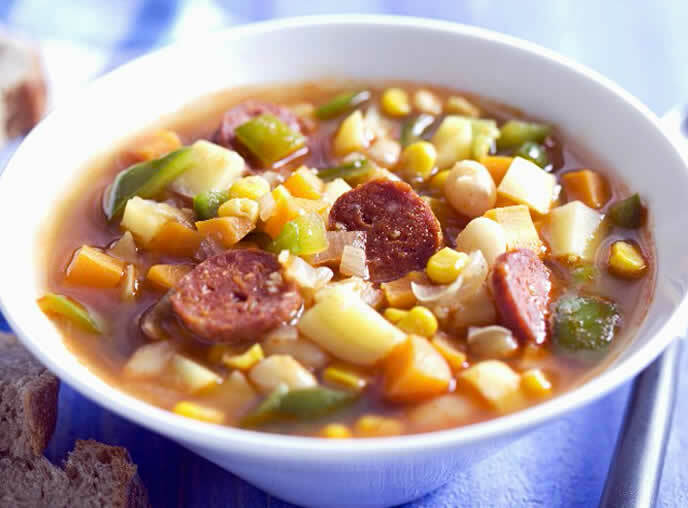 Classic white bean soup with zesty sausage, Ole! Heat 1 tablespoon olive oil in a large skillet over medium heat. Add the sausage and cook, turning occasionally, until browned and cooked through, about 15 to 20 minutes. Transfer sausage to a plate. Reduce heat to medium. Heat remaining 1 tablespoon oil in same skillet. Add onion, garlic, and green peppers. Cook, stirring occasionally, until onion is softened, 5 to 8 minutes. Add carrots, potatoes, corn, beans and broth and cook, until the vegetables are tender and the soup is slightly thickened, about 10 to 12 minutes. Season with thyme, salt and pepper. Slice the chorizo and fold it into the soup; add a little water if soup is to thick, if desired. Divide among serving bowls. Serve.